Olav's Tap and Tack is a cozy little inn located in Bruma. It is found near the east gate of the city, across the street from the house for sale and next to Brotch Calus' House. The publican, Olav, buys potions and food but only sells the latter. The ground floor contains the dining room where most of the regulars can be found. Entering the lower level through a door with an easy lock is not considered to be trespassing but you will not be able to pick up any items here or sleep in one of the two unowned beds. You may sometimes find Ongar the World-Weary eating here. The room you can rent is on the upper level and contains a lower-class bed and chest of drawers. Next to yours is the room which has been rented by the vampire hunter Raynil Dralas during the quest A Brotherhood Betrayed. The room can only be entered by pick-pocketing the key from Olav but the bed cannot be slept in. A Brotherhood Betrayed: It appears that a vampire in town was recently killed by Raynil Dralas, a self-proclaimed vampire hunter. A Matter of Honor: Alval Uvani, a traveling Dunmer merchant skilled in Destruction, makes a perfect target for a forest ambush. 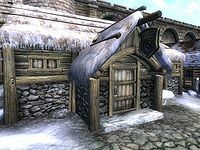 According to a note found on a table on the first floor of the Bruma Fighters' Guild, Olav's Tap and Tack was not always a tavern and used to provide "for all your horse needs." Fights will frequently break out when guests try to eat at Olav's Tap and Tack. This is due to the fact that Olav's is owned by a faction consisting only of Olav and the guests were omitted from it. Esta página foi modificada pela última vez à(s) 18h29min de 7 de junho de 2014.